New York temps have been mild this Winter and I have been taking advantage of it. I've been wearing a lot of dresses and of course most of them are wrap dresses. My latest count for making them I believe is about a dozen... seriously. I saw this dress on Polyvore (Long Sleeve Oriental Print Flower Mock Wrap Dress) and it immediately reminded me of the fabric I purchased last December. 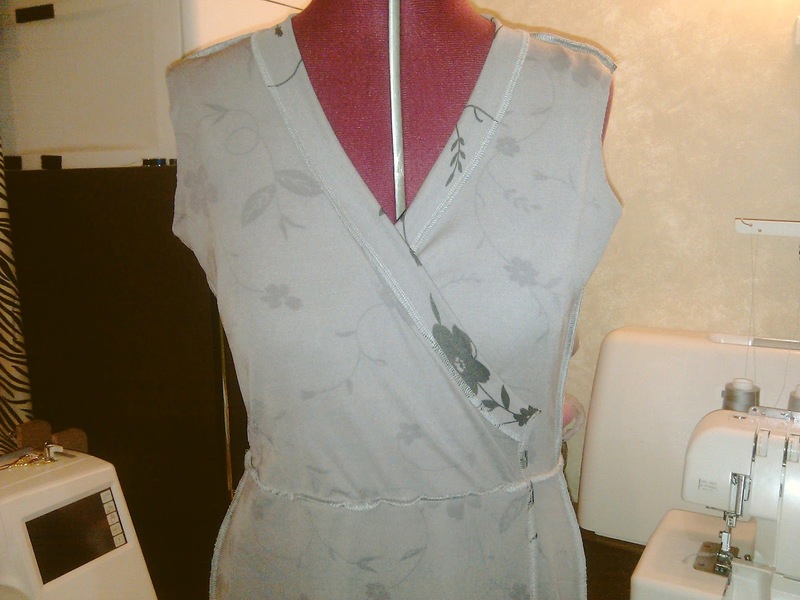 The fabric is a poly/spandex knit and has great drape... The dress is another remake from my rtw wrap dress template. The dress went together quickly, all the seams were serged, opted out of the ties and instead sewed the overlay skirt to the under skirt and machine hemmed the skirt. Debated whether I wanted it sleeveless or with sleeves and in the end went with short sleeves, which were also machine hemmed. Simple, comfortable and perfect for today temps. Until then... Hoping your Week is going Good. You did a great job and it looks lovely on you! Awesome, such a great fitting dress and I love the cardigan. That's lovely. You also have a very neat sewing room. Oh, I love this dress, especially with the pink cardi. 12 dresses? Wasn't that a movie? 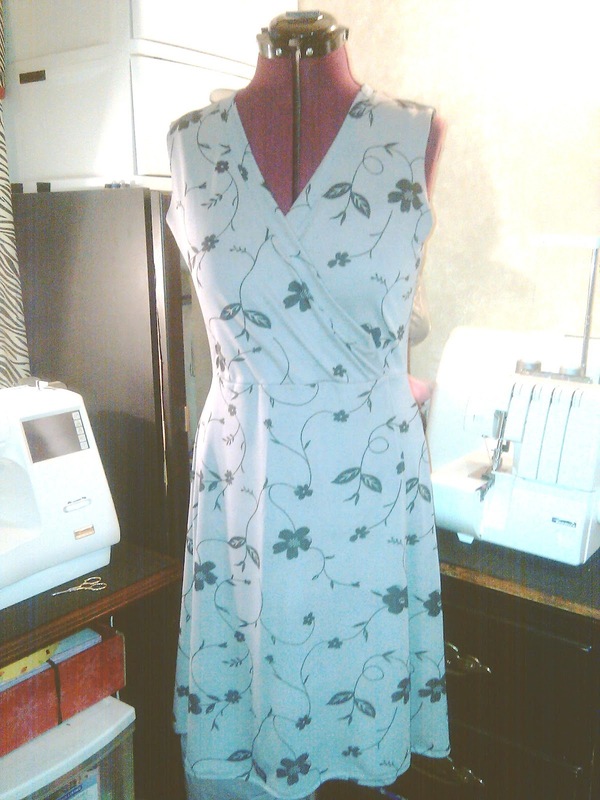 Another winning wrap dress for sure! I am the only woman without a wrap dress in her closet. As soon as I finish my SWAP I really think I need to make one. I love the grey and red combination and I really like the print. You look lovely, as always! Your iconic wrap dress are always such a hit! Oh, very nice! 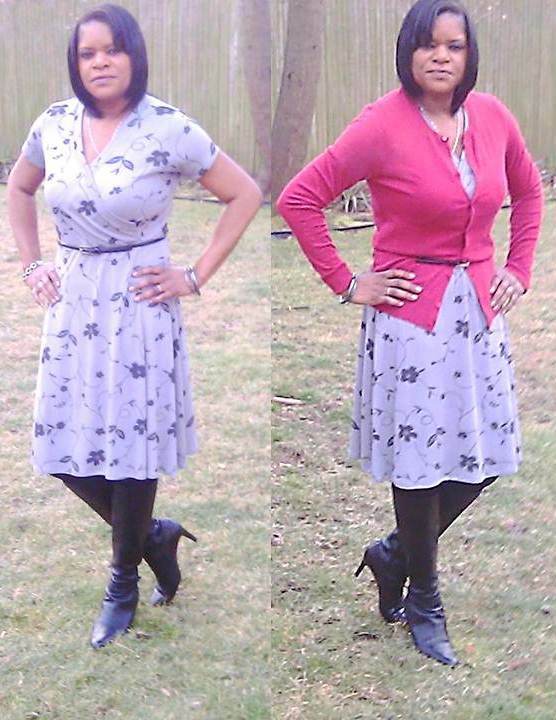 I especially like the pop of color with the cardi. So very pretty and a great fit too! I have a knit wrap dress next in line but I was thinking of bumping it and working on something else tomorrow, now I'm inspired again to make it. (Carol, you are not the only woman without a wrap dress! I tried one - it was awful on me and I posted the pics to prove it.) Sheila, when you say it went together quickly...what is "quickly" to you? Like, 1 hour would be quickly to me, maybe even 2 hours for a finished garment. This looks fabulous, as usual, but how long did it take for real? Your dress is very pretty! The weather has been really mild and perfect for wearing dresses, hasn't it! I love your wrap dresses and they look beautiful on you. Beautiful dress and the fit is perfect! Very lovely Sheila! I too love the pop of color with the cardigan! Love that fabric! The dress is amazing, as always. @ Velosewer: Thanks, I make every effort to keep all my crafty paraphernalia in its place. The room is multi-purpose, serves as a dressing room, reading, exercise, etc. @ Mary: lol... its 27 dresses, at the rate I'm going I just may get there. @ Carol: you have a fabulous collection of sheath dresses and can understand not having a wrap dress in the mix. 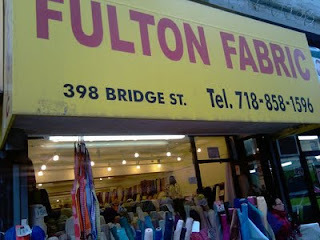 @ Debbie & Carolyn: you have played a big part in my love of cardigans. @ Beth: looking forward to your dress. @ Sister: Quick for me is 4 - 6 hours if I don't diddle & daddle.